Do harsher criminal sentences cause more or less crime? A recent study completed by Estelle and former Hope colleague Dr. David Phillips, now of the University of Notre Dame, found harsher sentences do not always reduce recidivism. 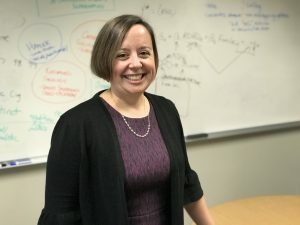 Their findings, published in the Journal of Public Economics, used a massive Michigan Department of Corrections data set on two non-violent felonies committed by adults in the state — operating while intoxicated (OWI) and first-degree retail fraud. Since those two crimes are treated much the same in terms of the state’s sentencing guidelines, Estelle and Phillips wanted to measure the effect of offenders’ sentences on their future criminal activity. After extensive study, they found harsher sentences reduce future felonies committed by shoplifters but not by drunk drivers. Estelle includes her research smack dab in the middle of her Hope economics classes, too, so as to achieve two objectives: remind Hope students that their professors are active scholars and provide effective examples on course topics. This research is consistent with Estelle’s interests in microeconomics applied to individual human behavior. In the past, she has looked at welfare policy and how that affects low-income women’s decisions to go to college. She’s also researched how women’s decisions to attend college affects their own children’s academic achievement and how parenting influences adolescent risky behavior. “All of these things probably sound very sociological in nature, but they are actually smack dab in the middle of some really awesome economic research,” she says. Estelle includes her research smack dab in the middle of her Hope economics classes, too, so as to achieve two objectives: remind Hope students their professors are active scholars, and provide effective examples on course topics. She uses her recent recidivism research, for example, in her “Economics of the Public Sector” class which aims to build students’ understanding of the causes and consequences of government involvement through spending programs (such as education, health care, and Social Security) and taxation. Work such as this always makes me feel all the more fortunate to have spent my teaching life at the college.